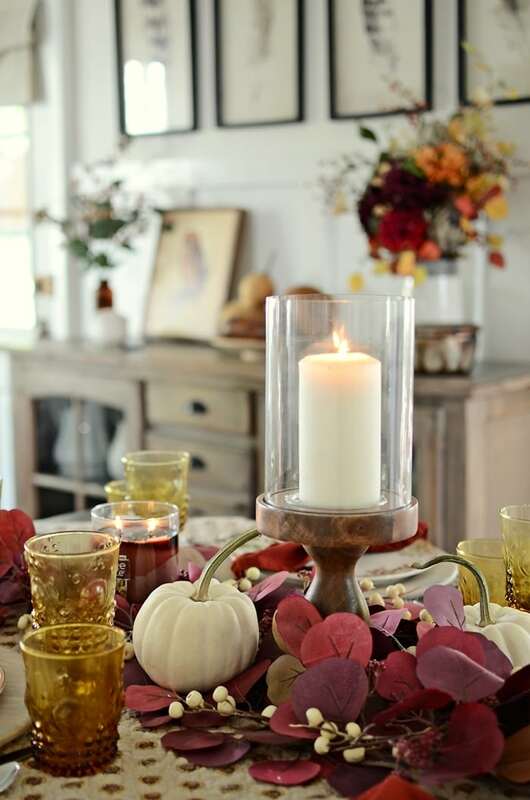 I love using vintage elements with decorating my house so it shouldn’t be any different when setting a table setting for Thanksgiving or any time of the year. 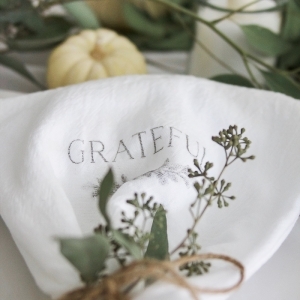 I’m sharing my Thanksgiving table setting today along with some talented friends all this week. 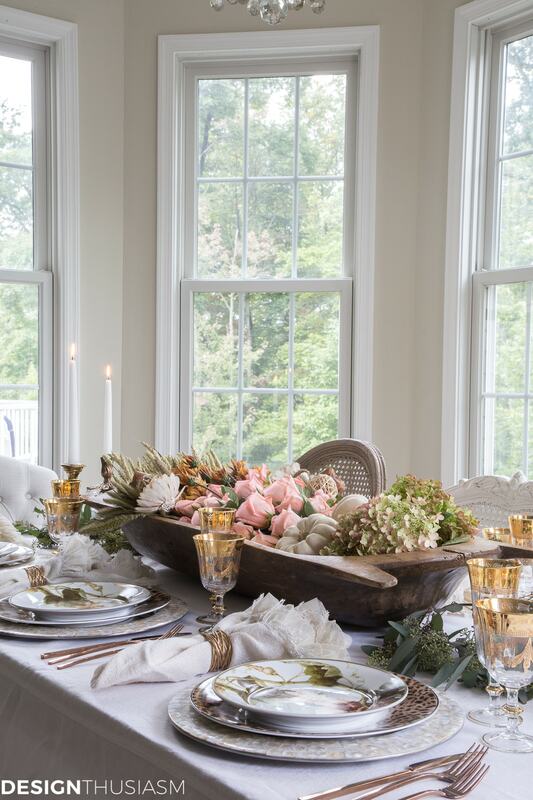 It’s the Styled + Set Fall Entertaining blog tour that is hosted by my friend Lory of Designthusiasm. If you coming here from Taryn Whiteaker, welcome! 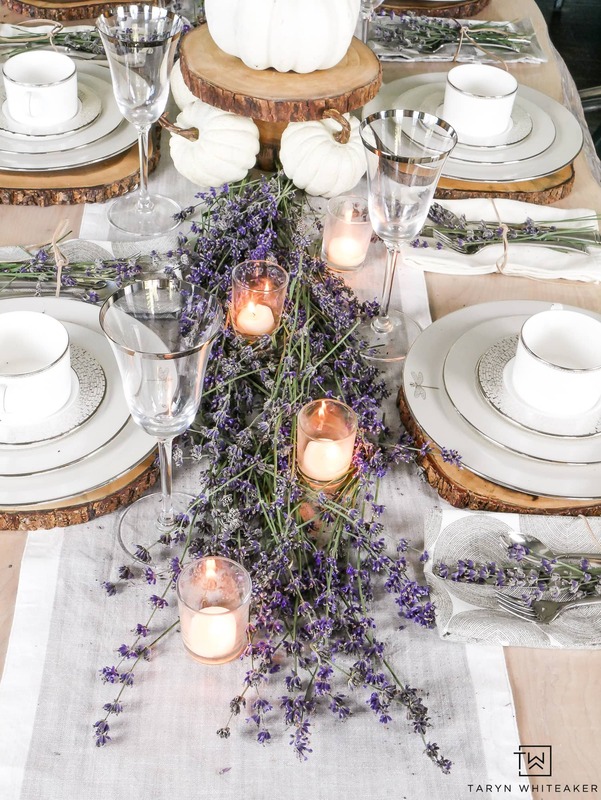 Our Thanksgiving here in Canada was last weekend so this was how I set my table for our dinner feast. We had seven people at our table though so I had to move a things around a bit so we can all eat around the table. 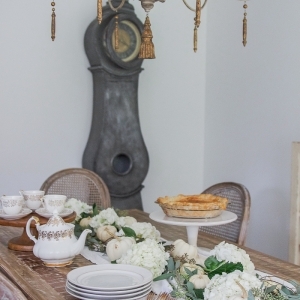 I love using vintage elements like the antique dough bowl to hold the muted colored pumpkins with seeded eucalyptus. 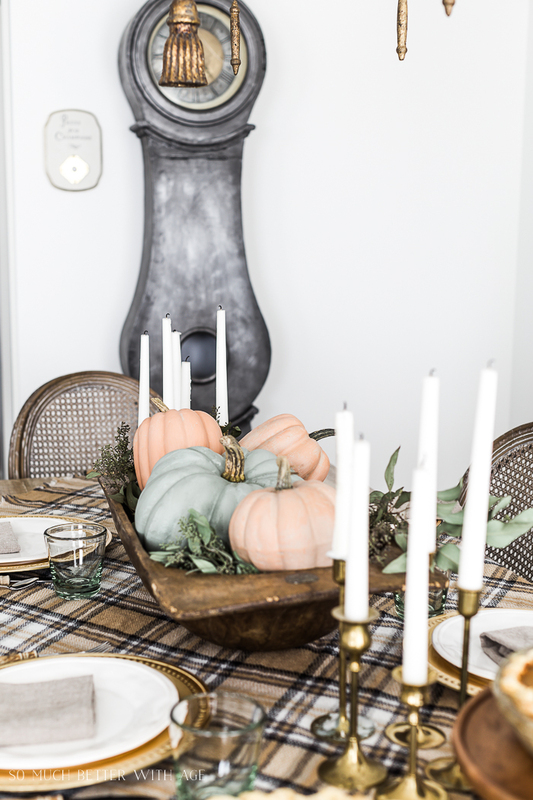 My collection of vintage brass candleholders that I found at thrift stores are perfect to add some height to the table and some shine. As I do every year, I made an apple pie and a pumpkin pie. My pumpkin pie cracked and I almost did show you but it’s still delicious and it looks rustic. Here is a recipe for my orange pumpkin pie but I’ll be sharing my traditional pumpkin pie recipe later this week. 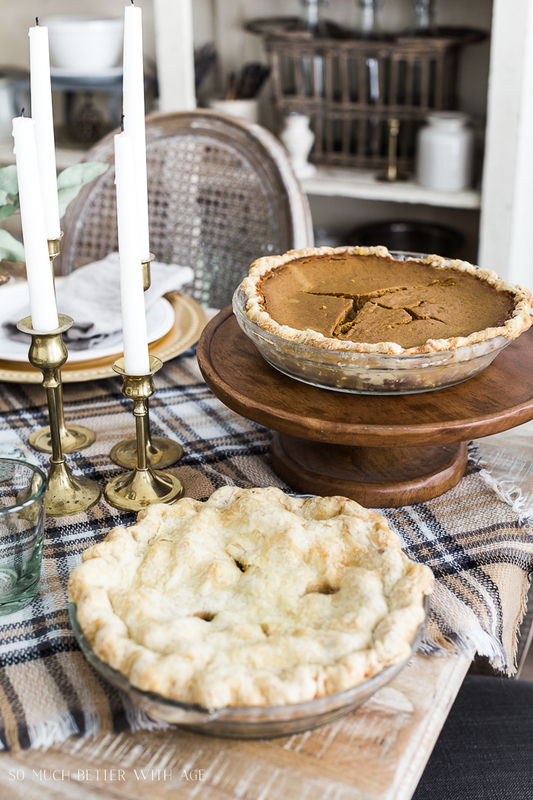 The best part about this table is that I used a plaid shawl for my tablecloth. 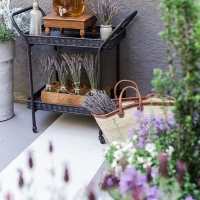 The colors go so good with these vintage decor items, don’t you think? 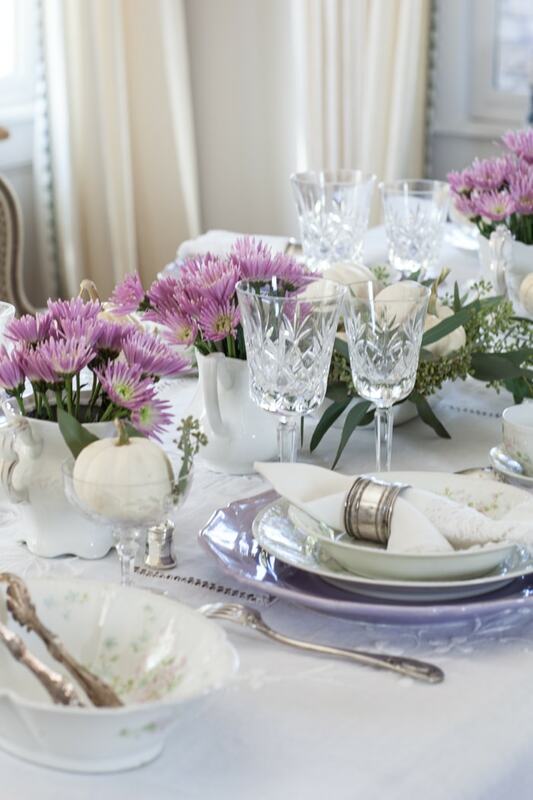 Thank you so much for joining me on my vintage Thanksgiving table tour today. 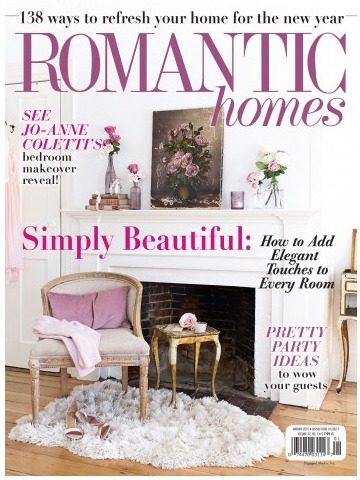 Now be sure to visit Jennifer at Town and Country Living to continue the blog tour. Every time I see a dough bowl like yours, I wish I had one! 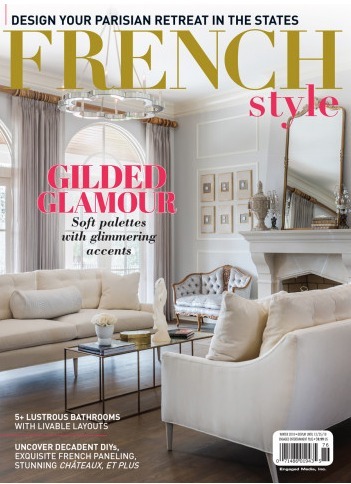 Love your collection of brass candlesticks, too. So pretty! It’s so versatile, Jennifer! Thank you so much. Oh so pretty. 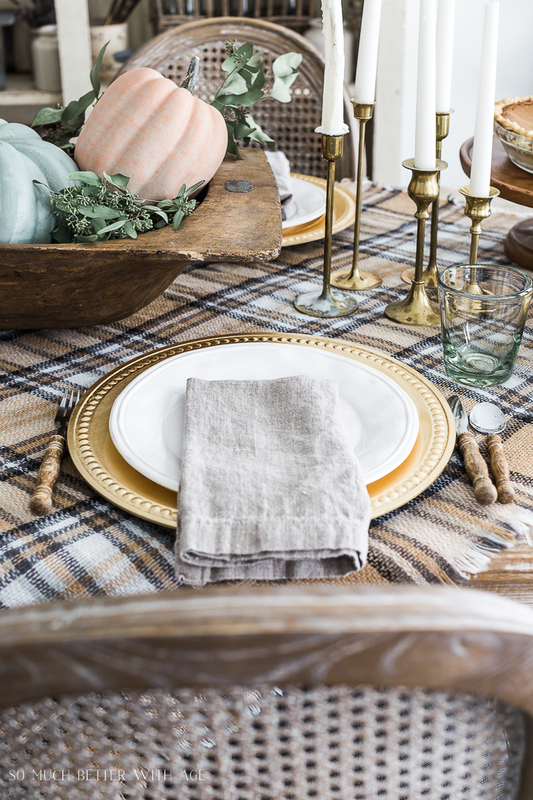 I love the plaid scarf too, what a great idea for a table cloth. Thanks so much, Marty. And so much cheaper than a tablecloth! 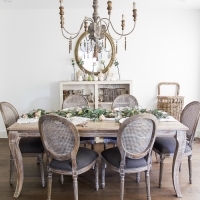 Your table is so awesome inviting and I really love the simplicity and style! Your pies look amazing! So, so lovely! I love all of it! unfortunately I won’t be able to set a Thanks Giving table this year since I’m having my kitchen remodeled but you have given me inspiration for next year. Thanks Margarita! That’s a very good excuse to not have Thanksgiving! 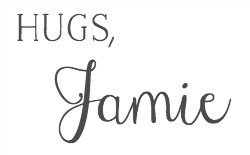 Hey Jamie, you are over cooking your pumpkin pie! The pie pictured is full of serious cracks! This indicates that it is over cooked. Pumpkin pis is a custard type pie, it needs to be removed BEFORE it is fully set. The center should be a jiggly, the carry over will finish the cooking. Insert a knife and there should be wet clingy bits on the knife. Had to let you know! Yes, thanks Jauquetta. I know it shouldn’t be cracked. I made two pies from scratch and backed them at the same time. I wasn’t going to redo it for the photo shoot. 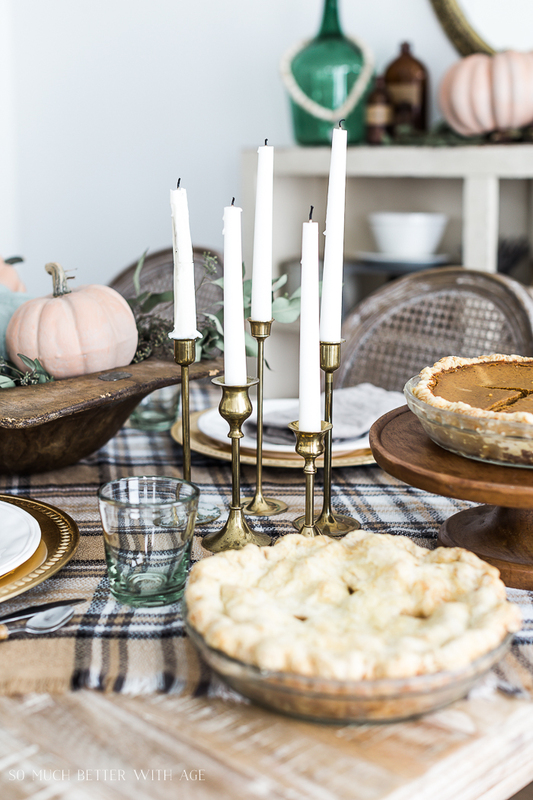 You have such a welcoming Thanksgiving table. How nice of you to make two kinds of pie for your family and friends. Thanks so much, Sheila. I found them recently at a thrift shop. Aren’t they great?! Wish we could shop together! Jamie, your table looks amazing. 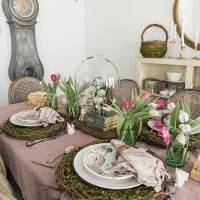 I luv the plaid tablecloth/blanket and I’m swooning for those desserts! 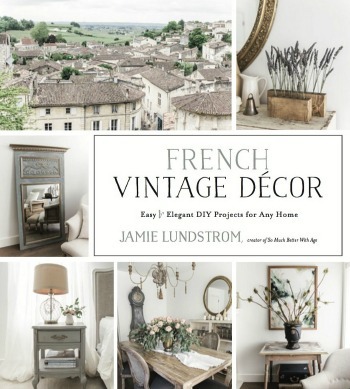 I’d luv to invite you to share it with us at Wall to Wall DIY Wednesday, which runs thru Mondays! Pinned! 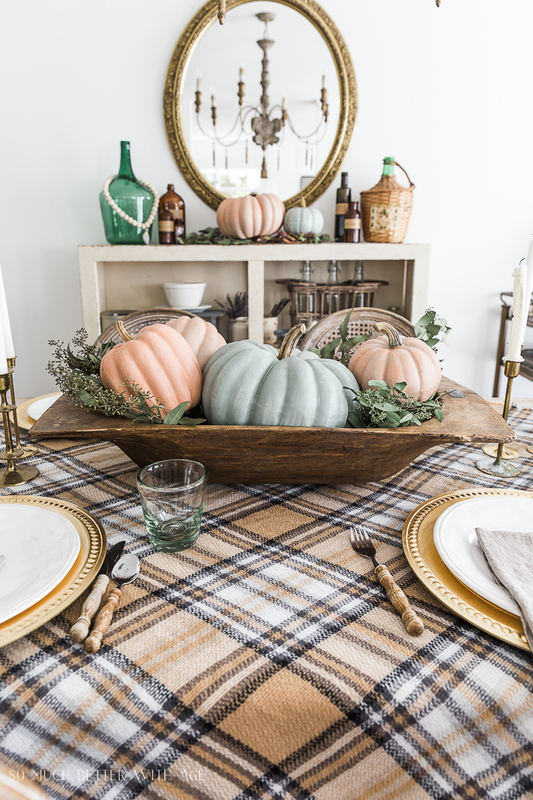 I love the idea of the plaid shawl for the table. Thinking outside the box! Love it. Jamie, your table looks gorgeous as always! And your pies look delicious (cracked or not!) 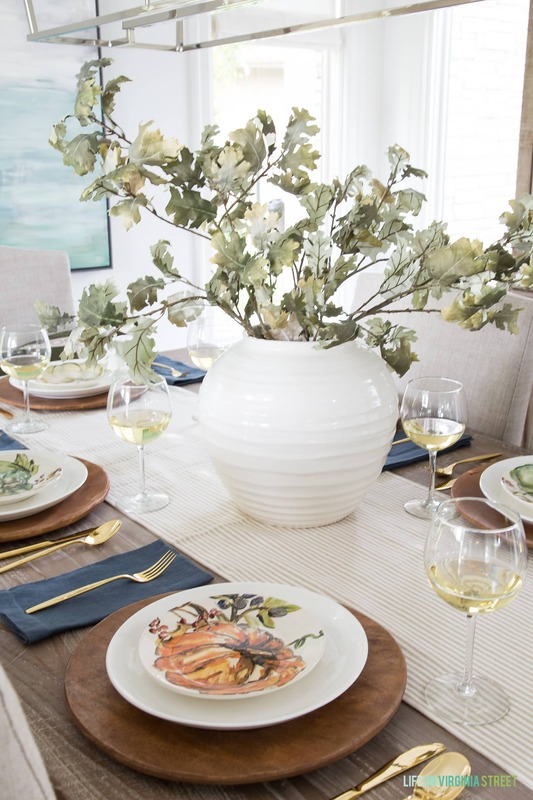 I always enjoying seeing how you blend different elements together to create your tablescapes—they always feel cozy and welcoming to me. Thank you for linking up at Merry Monday. I’ll be including your table decor in my Party Features. I hope you have a wonderful week! 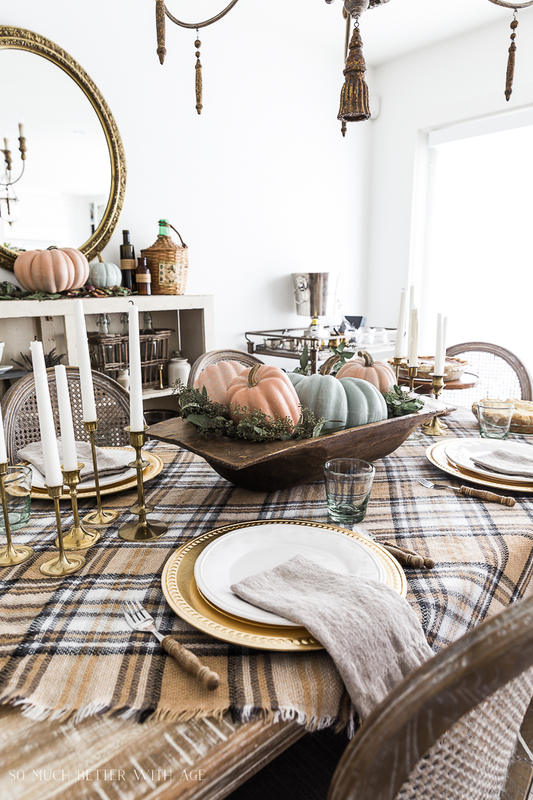 I love how you used the plaid shawl on an angle to dress the table. Great idea and will be including this in this week’s MM roundup.